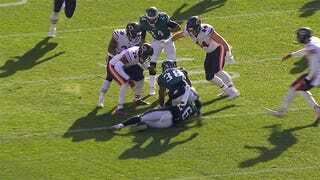 The 9-1 Eagles are beating up on the 3-7 Bears today, leading 24-0 at halftime. But the smartest play of the day goes to Kenjon Barner. The Bears were backed up in their own end. After blowing a timeout to avoid a delay of game on their own 1-yard line—saving themselves a half-yard—Chicago punted. It was tipped by the Eagles, and went only 44 yards. But as the ball was bouncing toward the 45-yard line, Barner grabbed Jaylen Watkins and pulled him away from the football as if it were a grenade. 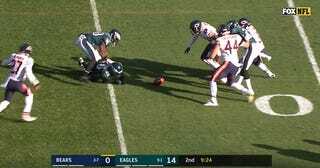 The Eagles have actually turned it over twice already today, and Barner made sure it didn’t happen a third time in the first half.